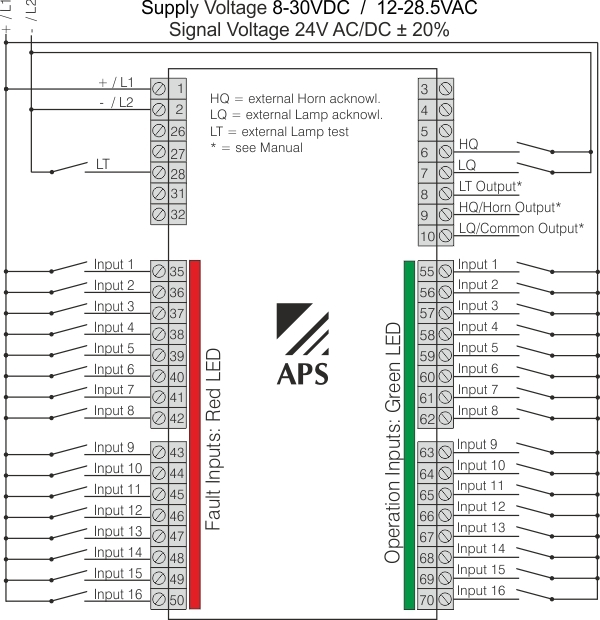 The AS-D16-BS is an operation/fault indicator with 16 channels for front assembly. It includes integrated controls for horn acknowledgment, alarm acknowledgment and lamp test. The built-in buzzer can be turned off. Each input (operation and fault input) can be switched separately between an opening contact and a closing contact. A time delay can be activated collectively for all fault inputs. The indicator process of the fault can be choosen between new value or first-up indication. The automatic alarm acknowledgment after energising the unit is activatable. It is also selectable if the operation LEDs shall be shown or suppressed during a fault condition. The AS-D16-BS has outputs both for the horn and collective output as well as for the lamp test. The function of the horn and collective output can be switched between the image of the control or remain active until acknowledgement. Programming is done using the controls built-in on the front. 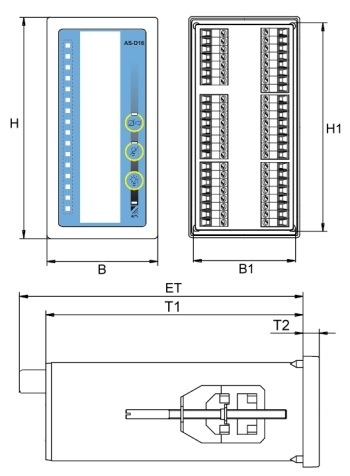 The AS-D16-BS is labelled with the supplied insert strips. The connection is done using the plug-in screw terminals on the back of the unit. 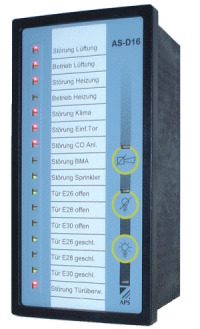 The AS-D16-BS operation and fault indicator is programmed using the built-in controls. No other tool or software is required. *The outputs LT (Lamp test), LQ (Lamp ack.) and HQ (Horn ack.) are only enabled using a DC power supply. The LQ and HQ functions can be customised, see the Programming chapter. The outputs are designed as a current sink and are not potential-free. If potential-free contacts are required, a relay must be utilised.